Anger is the single most dreadful disease a human being can suffer from. This leaves the person totally incapacitated and helpless, more like an invalid. Anger robs the person of discretion, reasoning, sanity and love. It breeds hatred, guilt and fear in the person. 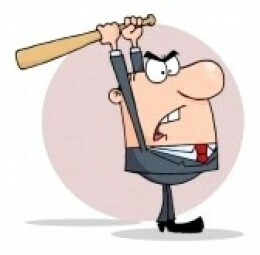 An angry person is afraid from within and feared by the outside world too. It is a double loss to the individual. The reasons for anger are many but the result is the same always; it gets a hold over our reasoning and wisdom. For any personal progress getting a grip over this vicious vice is imperative. Learn to be forgiving: I am mentioning this first because this is the most difficult part. Anger makes us do and say things we regret later and it becomes very tough to forgive and forget. It may be possible to forget the other person but the real test and challenge is to forgive oneself. If we are able to recall the pain of forgiving oneself then getting a hold over that anger trigger will seem an easier hurdle to overcome. Personally, this has been my toughest battle. I am totally unforgiving and very vengeful by nature. Getting angry was equivalent to raising hell and severing ties with the person totally. Am a better and more self forgiving person now, anger still comes but goes away real quick. Find an acceptable outlet for yourself: Getting angry is not so abnormal, but getting out of control when you are angry is the worrisome part. If we have a reasonable, more acceptable channel to release our steam it is a safe bet to go for it. This activity or outlet must be easy and something that comes spontaneously to the person concerned. If the person has to seek an outlet which is not very close to the heart then it never pops to the mind when the person is getting angry. My counselor used to tell me to drink water, count to 10 or switch off mentally. All the three were not my cup of tea! I could never think of water or even casino manage counting and switching off was impossible when I was so boiling with rage! I decided what worked for me was, leave that place. Just get away and revisit it when you are calmer. So, seek your own individual outlet, please. Else you will get angrier at not being able to control your anger! Regular dairy writing, prayer and meditation proved to be my panacea. I did this with dedication; in fact I am still doing all the three, for 3 months and I could see a change in myself. I would sit and write about the situation, and what exactly caused the anger to surge in me. I realized that none out of ten, it was something very frivolous and easily ignorable. All I had to do initially was move away, and with time I could mentally switch off myself. At times I still used to get angry, react, and then write about it in my dairy. This worked as an introspective tool for me. I would read it through and promise to myself to put an end to this. It took me 3 months of sustained efforts and a conscious deliberate determination on my part to overcome my anger. I am not saying I have conquered this vice but I am on track and continuing to do so. Despite these individual differences we all are not so different really, because in the end we do get angry and are afraid of losing control. So, see what works for you and walk on the right path right away. Letting go of anger gives us courage unknown and we feel less burdened and light enough to be able to fly. Good luck and new beginnings to all of us. and also included your RSS feeds, so when I have time I will be back to read much more, Please do keep up the awesome b.